This round I am reconstituting each injection fresh (instead of making one big batch and refrigerating). I also restarted my workouts. Take 2g of NMN (sporadically), 1 tablespoon of C60OO (sporadically), and have reduced the amount of gluten in my diet. Again, I’ve noticed a chg in my sleep patterns -where I seem to need less sleep. Have also noticed muscle cramps. Looking forward to hearing from you Darren. Has you hair remained thicker and darkers? hi, actually it seems to thinning now. I haven’t taken any foxo4-dri since Oct.
Hopefully, this next round will show an improvement again (I don’t care much about my appearance–just would like more evidence that FOXO4-DRI is working). Will start Round 3 tomorrow. Thanks, just asking because it is more of an easily observable change. Good luck with round 3! Did you notice a reduction in gray hairs during your first and second rounds? Since you work in the “industry” do you know what kind of peptide synthesizer is used for production? Since a side effect of FOX04-DRI is a reduced ability to heal wounds did you notice an increased level of soreness from any of your exercising? If I were to self experiment would I need to take some time off from weight training? If you also take NMN 2 g per day, how will you say it is due to Foxo4dri or NMN? Yes. Or if the latest tests that come out showing improvements (I assume they will!) are because I’m now working out, or using C60 and Olive oil, or because I’m cutting out wheat from my diet. Or was it a combination of senolytic therapy and any of these. Frankly, there are too many variables in a human to do a controlled study. As an aside, I wonder if actually drawing blood more often for tests(and donations) is helpful to remove some of the systemic pro-aging factors accumulating. 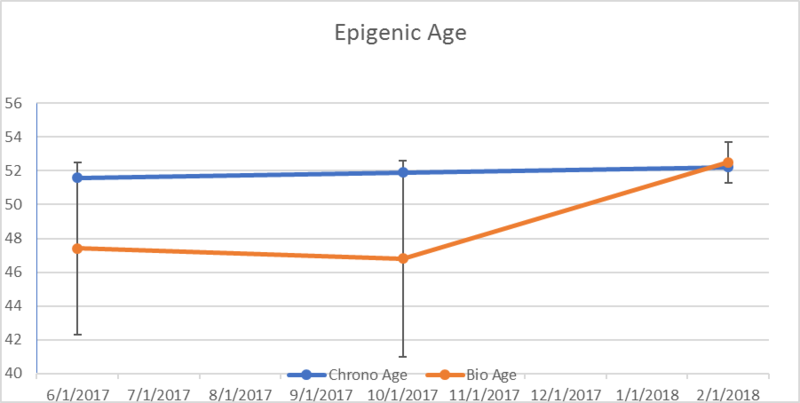 As a another aside, because the 3 gene markers selected for DNA analysis were selected because they give the best correlation to chronological age– is it going to be admissible in giving an indication of biological age? Any progress with your round 3? Is your hair thickening again? How about general well being? Yes! very exciting, can’t wait until tomorrow. Hi, The study did show good outcomes with mouse kidney. I saw no change with my kidney related blood markers except for BUN which did show an improvement only after the last round, and who knows -maybe I was just more hydrated. I certainly can’t recommend anyone taking this very untested substance. Have you received DNA bio age result? 1. When you inject 30 mg, how much saline due to reconstitute it in ? 2. Where do you usually inject it in ? 1. about 1ml, it dissolves very readily. 2. subcutaneous in belly flank fat. I’ve been looking for info as to whether elevated levels of testosterone in TRT men would inhibit any effects of the injected peptide. Have you come across any discussion / info in this regard ? Well, to get the full benefits of a senolytic it is important not to inhibit SASP prior to administration… and anti-inflammatories repress NF-kB — which inhibit SASP. Testosterone effects a lot of stuff down stream. it increases both mTOR phosphorylation (can be blocked by rapamycin) and both ERK1/2 and Akt phosphorylation. So best to not use testosterone prior to a senolytic. Interestingly, Metformin may be an excellent drug to take before a senolytic because it ‘lowers the bar’ for cells with DNA damage to become senescent (https://www.tandfonline.com/doi/pdf/10.4161/cc.11.6.19665). Thank you so much for the info Darren ! I was thinking that after Fox04 injection, testosterone replacement therapy can be restarted 2 weeks later. Your Bio Age results indicate 52.5 years. So it went back up after the latest round? Yes, and it became 4 times more accurate. Because they pick the genes that correlate with chrono age, this test is actually not very useful at determining if my bio age has improved. For example my blood work has improved a lot– heck, I used to have Metabolic disease but that has disappeared. Thanks for doing the hard yards. What is the latest today? Are you alive? Are you well? Did you take more Fox peptide? In fact, today I’m doing another short interview for a Belgian TV station. They will tape me giving a blood donation and talk to me about my Optimal Longevity Protocol that I’ve been working on. I will take a shot of FOX04-dri -but the TFA salt free version—FYI: TFA salt is somewhat toxic and could have been behind the mosquito-bite like reaction myself and others experience. If you do not ask for TFA salt free then you will get with TFA. I want to be a tester of your products if somebody can help me. I am 21 years old want to live to 200+….i think foxo4 dri is the one. I placed an order with Breakthrough Labs, one of your listed sources. I have not received my order. I have attempted to reach them multiple times via their telephone number and chat function and reach only an automated response system. No one will return my call or email request. Do you have any knowledge of this ? Just did the Young.AI analysis and came up with a biological age of 33 when my chronological age is 64. That is encouraging since my epi age is 65 and telomere age is 66 for median length but 54 for average length. I agree that epi measures might not be useful since many epi changes are positive e.g., for cancer expression. I wonder how accurate Young.AI really is. My dashboard there says that my triglycerides are critically low but they are at 72, not a great number but normal. That could just be their conversion factor (I think they use index numbers) for their graphics or could be an underlying issue. BTW I just started on a new round, the second in a year, of FOXO4-DRI. Every other day for 15~ days, I think. I have been tired as crap. 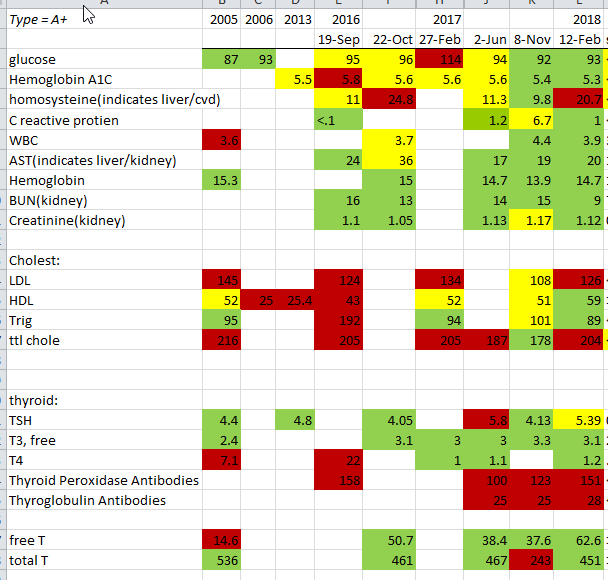 I hope my next round of blood tests will show a drop in homocysteine and other markers of inflammation. Since nothing else will change in my regimen I will also be measuring telomere length for the 4th time and the 3rd time with LifeLength and I hope to see a statistically significant increase in telomere length which could indicate that my body’s regenerative capacity has increased and thereby amplifying the effectiveness of FOXO4-DRI as a senolytic. I have been taking 32mg of TA-65 daily for 9 months. Another measure of the effectiveness of FOXO4 could be exercise capacity. Those measures are all being done as well. Since FOXO4 is the only variable here we’ll see if we could associate positive changes out of the ordinary with FOXO4. I’ll report back in December. Hi Darren. Do you have a link to the Belgian TV program or else the name of that program? Thanks and good luck! Hi, how are you going with this latest round? i am currently researching about the effects of foxo4-dri and the correct dosage per day in clearing senescent cells, and whether i could provide it as a pill. could we get in touch so i can learn more about what the effects were for you? Emboldened by your work, I decided to go ahead and try FOXO4-DRI. I started with with small doses (5mg, 10 mg) every other day for the first week. I then upped the dosage to 30mg every other day, and am right now up to 45mg every other day. I am a 39 year old male (balding), and I weighed 85KG to start the trials. I am finishing up my last injection today. Unfortunately, I did not do any of the DNA or blood tests that you did. What I noticed is that I don’t physically feel any discomfort when taking doses under 30mg. The FOXO4-DRI was dissolved in PBS solution and injected subcutaneously. I injected in thigh, abdomen, deltoid (upper arm), and buttocks, trying different places. At doses at or above 35MG, I felt a slight discomfort (very slight nausea) in my chest. Kind of like slight heart burn, but much less severe, and I also had problems sleeping due to this discomfort if I injected prior to sleeping. I got rid of this feeling of discomfort by walking around in the hour/two after implementation. I have found that keeping in shape is much easier–I have more energy when I go to work out on the treadmill. I work out in the same routine (treadmill running) as I did before I went on FOXO4-DRI and keep a consistent diet. I weigh 85KG, and found that after getting on FOXO4-DRI and continuing the same workout routine, I lost 2KG. I feel more energized in my workouts. Besides that, my hair has not grown back at all (I am a balding 39 year old), and I have not seen any noticeable changes in that department. I do feel physically slightly lighter/healthier, especially around my gut/chest area. Other than that, I don’t feel much different. Thought I’d share, and I hope you keep posting as well! Thanks so much for your bold work. I thought I’d follow up and be a little more detailed in my post so others can benefit. I am 39 years old, and weigh 85kg. I administered a total of 400 mg of FOXO4-DRI (TFA salt removed). I kept the FOXO4-DRI in the freezer until reconstitution time, and reconstituted it in an industry standard PBS after letting the polypeptide thaw out for 4-5 hours. I keep a regular diet and exercise routine–I run a 10k every 2-3 days on the treadmill at the gym. I take a general vitamin supplement, along with a garlic supplement, daily. I kept close track of my physical appearance (photos of body and hair) as well as my weight during the entire trial. I injected FOXO4-DRI every other day, starting with smaller amounts, and built my way up in terms of dosage until I was administering 30-40mg per dose. In order to reduce the pain from injections (I hate needles), I administered at night before going to bed. As I wrote earlier, with injection amounts exceeding 30mg, I felt a very slight chest/gut area nausea, similar to heart burn but much less intense. This kept me awake, and I got rid of this feeling by walking around for an hour or two. I guess you could say in this sense I definitely experienced the same kind of insomnia you experienced, but it was definitely due to the chest/guy area feeling I alluded to earlier. This discomfort would pass within 90 minutes after subcutaneous injection, and I could fall asleep again. The first few times I administered, however, I definitely woke up out of this discomfort. I administered in a variety of different areas–buttocks, deltoid (upper arms) muscle, thigh muscle, and abdomen. Overall, as I stated earlier, I lost 2KG (dropped down to 83KG from 85KG), which is definitely due to the FOXO4-DRI since I was at 85KG and on an identical workout routine/diet before I started. I feel lighter, and my chest/gut feel more in shape. Physically, I feel slightly better overall. My body feels “tighter/denser” if you will. I have more of a desire to workout, and I find physical workouts (running on the treadmill) much easier, and that I have more energy for them in general, and that I have been regularly exceeding the 10k distance. The feeling of discomfort you get when you haven’t worked out enough tends to come more often, is the best way I could describe it, while on FOXO4-DRI. My hair (I am balding) has remained in the same balding pattern, and I haven’t noticed any significant change on the hair loss front. The only other thing I have noticed is that I tend to get cuts easier (careless bruises/scrapes tend to bleed out more/my skin tends to be a lot more sensitive to cuts), although I wouldn’t describe it as hemopheliac level. But during adminsitration I’d advise being extremely careful about getting scrapes and cuts. Also, on the mornings after I administered amounts in excess of 35mg, I found that I often ended up burping in the morning (gas release) a couple times. Not a lot, but at least one huge burp or two. Also, in the immediate hour after administration, while experiencing discomfort/insomnia, I felt drinking water decreased any slight physical discomfort or nausea I felt. I tried administering in mornings a couple times, but the physical discomfort/soreness from administering shots made me avoid this so I moved back to a night schedule. Overall, the visible benefits that I have noticed are (increased physical energy/desire to work out) and weight loss. Of course, if the FOXO4-DRI is indeed working and has caused apopstosis in some of my pro-inflammatory senescent cells, there is no way for me to know. The physical differences I’ve noticed are definitely not on the scale observed in the mice trials. I don’t have much body hair to begin with, anyway, so hair/physical appearance didn’t show much of a difference. As I stated earlier, my gut feels “tighter” and I feel more of a desire to work out than I typically do. 2) FOXO4-DRI is expensive, and not easy to obtain. There are tons of fake FOXO4-DRI dealers out there. 3) The obvious factor that human trials haven’t been done enough, so those of thus that are trying it are subjecting ourselves to long term risk due to lack of human trials. I am on my last day of FOXO4-DRI administration. Thanks again, Darren, and I really hope you continue your posts here so the rest of us can continue to watch/monitor, and contribute. I plan on possibly administering another trial in 6 months/a year from now.